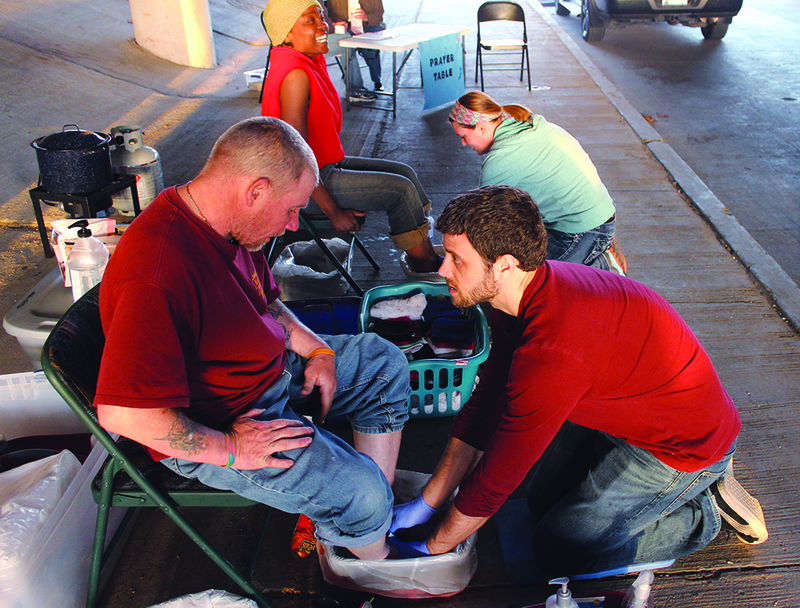 Under a bridge, come to the feast (reporting from Tulsa, Okla.): Christians show love for the homeless by preparing meals, washing feet and praying. TULSA, Okla. — Street people lying on the grass and perched inside concrete nooks watch as a long, yellow moving truck backs under a downtown bridge. Interstate 244 rumbles with traffic overhead as men, women and children from the Park Plaza Church of Christ slide open the truck’s back door and pull down a metal ramp. In less than 30 minutes, the visitors from a more affluent part of town unload and organize a hefty bundle of equipment and supplies: Frozen hamburger patties and fresh buns. Chairs and round tables for dining. Hygiene products such as lip balm, razors and deodorant. Donated seasonal clothing items. Even a popcorn maker. The scene repeats itself each Thursday night as Christians from 15 minutes — and a world — away fire up an industrial-sized grill, arrange foot-washing and prayer stations and endeavor to connect with neighbors. “We are down here in hopes of showing God’s love in action,” Anisa Jackson, one of the ministry founders, says in an orientation meeting with regular and first-time volunteers. This story appears in the May 2014 print edition of The Christian Chronicle.